This is probably not what he was looking for. We've all been there before. You're hitting the town on a night out for your birthday and wouldn't mind some free beverages to celebrate the occasion, courtesy of the generosity of whoever wants to pay. Luckily for birthday boy, Nick Matthewman -- his mate Rory had cracked a genius plan involving The Bankers Draft pub in Sheffield, England, and the venue's pre-order mobile app on Wednesday night, to fill the evening with some complementary liquor. But here's the thing -- you should never trust the Internet to have your party's best interests at heart. Rory certainly didn't and it was Nick that ended up paying the price. In other words, things didn't quite go as Rory had planned them. In fact, they went very, very far in the opposite direction. Firstly, the non-alcoholic beers came. 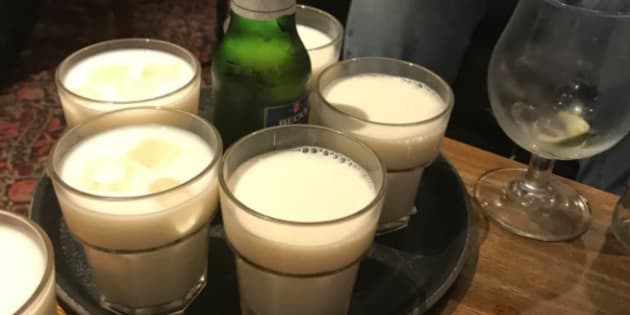 But then, before Nick's birthday celebrations had even really started, the online world who had tuned into Rory's requests for some free drinks, began to shower the pair in glasses of milk. And while there were some nice people who thought Nick might actually need something a little stronger to drink than milk for his birthday, things only got weirder from there. To the delight (or possibly the displeasure) of the staff at The Bankers Draft, the orders kept coming for the young duo -- even after they had left the venue. Unluckily for Nick, the orders did start to get more alcoholic following his exit from the pub but by the look of Rory's Twitter updates, he was too busy having a bit of a boogie on his birthday to really care. Another jäger bomb, San Miguel and nachos just come through, I'll have them if that's okay boys?? In the end, if there's one thing Nick and Rory should really learn from the night of birthday escapades -- it's that the Internet is always willing to have a laugh at your expense. But in the name of Table 67, it seems Nick might not mind that idea too much at all.